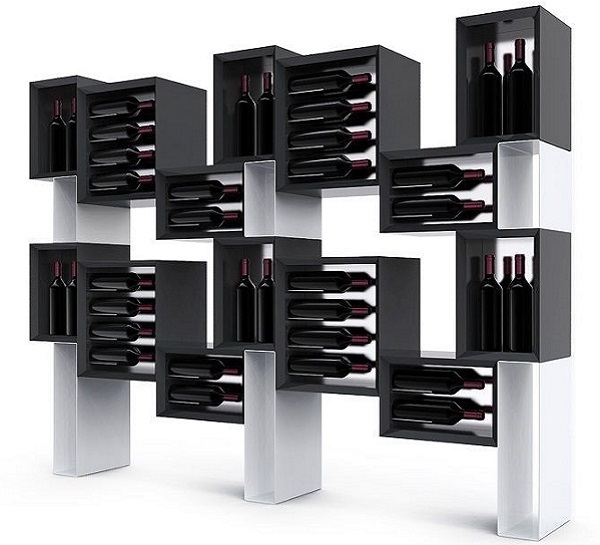 It is the stand-alone modern wine rack with a contemporary design which allows you to define spaces using the bottles and other wine accessories, a double sided bookcase fitted with container boxes with dividers made of bi-matt finish plexiglass, ideal for dividing open spaces; it can hold up to 72 bottles and also wine accessory objects, your own discoveries, your favourite books. It is ideal for use wherever there are wine bottles; it is a modern design wooden wine rack, ideal for use in the home, and is a high impact communication object when furnishing wine bars, wine shops, wineries tasting rooms and retail stores. The bottles are stored individually allowing fetching the needed bottles easily without disturbing or re-arranging other bottles.